On average, prices have been going up over time, but not as fast as memory suggests. Another factor is rising taxes. That is money out of your pocket and mine, siphoned off by government and wasted on needless or even mindless things like the wars in Iraq and Afghanistan, but rising taxes are not the same as rising prices. Here is an interesting BLS statement from the report that bears a closer look: "A broad array of indexes posted increases, including shelter, apparel, used cars, medical care, tobacco, and recreation." One of the reasons used car prices rose was the inane cash-for clunkers policy that destroyed productive assets. This is similar to FDR destroying crops in the great depression, on a much smaller scale of course. Without a doubt, medical prices are rising as a result of inept government policy. The recently passed medical reform bill will not help any. My point is one must distinguish between why prices are rising, not just note that prices are rising. For example, prices rising as a result of an expansion of money supply or credit are a true effect of inflation (inflation itself being the rise in money supply or credit). Prices rising because of inept government policy (or because of supply constraints like peak oil) do not constitute "inflation" nor can they be considered a result of "inflation". Finally, in regards to housing, note that rental prices, specifically "owners' equivalent rent" is the single largest component of the CPI. Thus, the BLS does not include actual prices in their analysis but rather imputed rents. Although rents have been falling the BLS reports rents are rising. Here is one possible explanation. When natural gas and heating oil prices drop, imputed rents rise and when natural gas and heating oil prices rise, imputed rents fall. The reason for this apparent anomaly is the BLS assumes heating is part of rent and one is getting more value for constant rental dollars when energy prices rise. 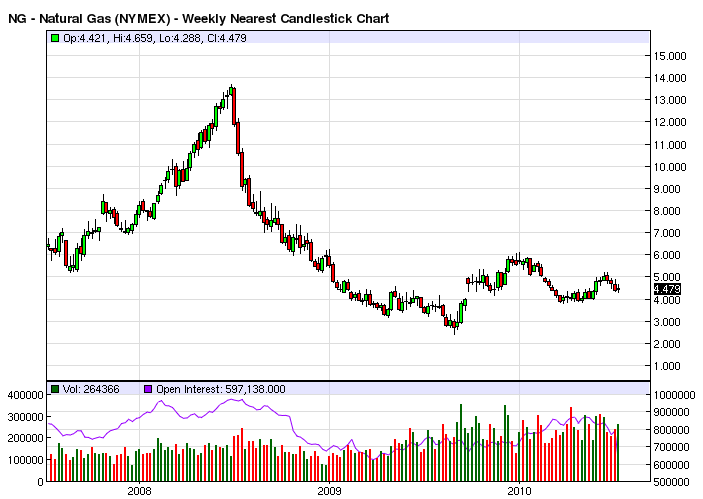 Here is a chart of natural gas. Natural gas prices are down in 2010 and that puts upward pressure on imputed rents. I think the whole thing is silly, and the BLS needs to plug in home prices directly, using the Case-Shiller housing index as a guide. Regardless, if gasoline prices continue to drop as I expect they will, the CPI will soon enough be in negative territory anyway. Bernanke has failed. "It" has happened.